NOTICE: We will be CLOSED FOR A PRIVATE EVENT on Saturday, August 25th. We host the local Girl Scouts annually with a day at the lake! It is a great event for these young leaders- We are happy to celebrate with them. For a list of where else to paddle on this day, see our Facebook page! Mammoth Kayaks is open six days a week for the summer 2018 - wind and weather permitting. We are CLOSED on Thursdays. We open every other day 10am to 3pm. The BEST WAY to check our status is our Facebook page "Mammoth Kayaks & Paddleboards". We will post a photo and weather conditions daily on this Facebook page. If Mother Nature does not cooperate, we will post early closings there as well. Like us on Facebook! OPEN 10am to 3pm (until the Sunday of Labor Day weekend Sunday, September 2nd, 2018) WE ARE CLOSED ON THURSDAYS. Please check wind/weather on our Facebook site daily. We are limited by our permit with the National Forest Service to allow anyone on the lake during extreme wind/lightening, etc. Safety first! Drive on up! Paddle on out! See you at June Lake! If you have any great photos you want to share, send them to rob@mammothkayaks.com and we will use them on website and on Facebook! We are the only paddleboard and kayak rentals on the beach at June Lake. OH Ridge Beach at June is our only true "swim beach". If you have not experienced this location, it is a must! June Lake is a pristine location - even Yelp gives it 4.5 stars. And there's no better way to enjoy the surroundings than standing in the middle of the lake. Paddleboarding is easy for all ages. Within a minute you'll be paddling out, totally free and in one of the most gorgeous mountain settings this side of the Sierra. Located a short 20 minute drive from Mammoth, June is the best way to enjoy the beach while you're in the mountains. 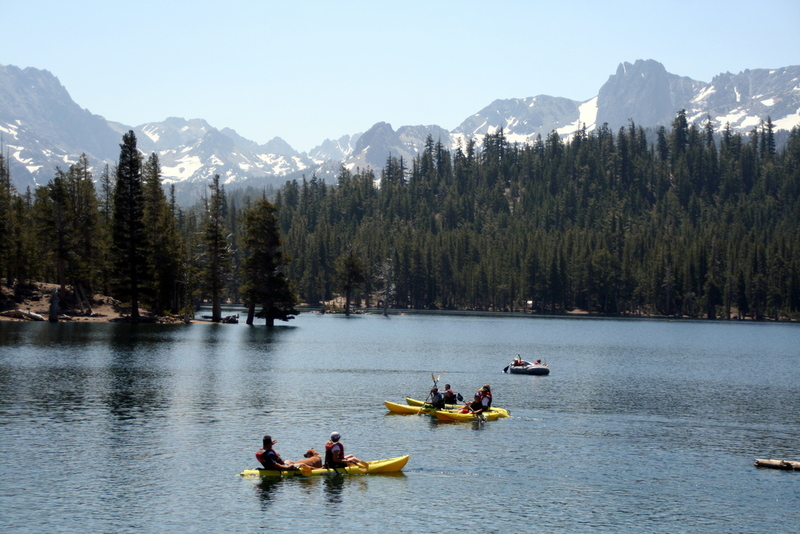 MAMMOTH KAYAKS AND PADDLEBOARDS IS OPERATED UNDER A SPECIAL USE PERMIT BY THE INYO NATIONAL FOREST - WE OPERATE FROM APPROX JUNE 15 TO LABOR DAY ANNUALLY. All of our rentals are just $25 hour. That includes paddle and life jacket which is mandatory. You bring the paddle power. Cash and Credit Cards accepted. We do occasionally have trouble with WIFI due to our location so cash is not a bad idea to carry with you. We have kayaks too! If kayaks are more your speed, take your pick between our singles and tandems. You don't need to bring much. Sunscreen - to protect that beautiful skin of yours. Swim suit - have we mentioned that you're going to get wet? Shade - it gets hot at June Lake! Towel - to dry off after your paddleboard or kayak excursion. Camera - make sure to take a few snaps of the memories and send us your best photos! Cash or Credit Cards - we occasionally have issues with WIFI due to our location so cash is not a bad thing to bring. Their is an ATM at the camp ground store! The best way to stay in touch and check weather, early weather closings, etc. is our Facebook page. Mammoth Kayaks and Paddleboards. Operated under special permit with the Inyo National Forest.